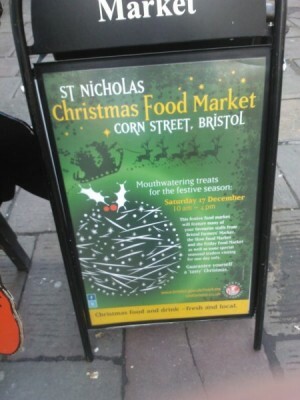 The best locally sourced food and produce from around the region will be on sale at the St Nicholas Christmas Food Market, this Saturday, December 17. And anyone looking to make Christmas extra special can come along and stock up for the festive season. The ever-popular Christmas market is open from 10am to 4pm in Bristol’s historic Corn Street. Artisan cheeses, locally reared meat and poultry, homemade cakes, chutneys and chillies and organic seasonal produce will be on offer from independent traders. In addition to the Christmas food market, the regular Nails Market and St Nicholas Market will be open to inspire shoppers to find perfect presents and gifts for family and friends. And there will be Christmas entertainment too – on Saturday, visitors can enjoy Christmas carols in the Glass Arcade from 11am to 12 noon courtesy of the Music Box singers, who will be singing in aid of Breast Cancer. On Corn Street from 12.30pm until 2pm shoppers will be entertained by the Water Aid Choir and from 2.30pm to 3.30pm the Ambling Band will be ‘ambling’ around the market in their familiar fun, lively and colourful manner. The festivities will also include the presentation of prizes at 11am to the eight lucky winners who nominated their favourite local traders as part of the 2011 Bristol Independents campaign. Prizes include a range of vouchers from some of the city’s leading independent retailers and suppliers.